There is a new study out this week that confirm just how important that annual mammogram really is. Unlike many studies that look at what happens following mammograms, this one looked more closely at the history of women who were diagnosed with breast cancer between 1990 and 1999. The study tracked them through 2007. Researchers at Harvard Medical School in Boston found that of the 609 patients in the study who died from the disease, 71 percent did not get regular mammograms. In fact, the the majority had never even had a screening mammogram, according to the study published in the journal Cancer. It’s important to note that of those who died, 50 percent were under the age of 50 . Other studies have shown that cancers in younger women tend to be more aggressive. The findings indicate the importance of starting screening at age 40, according to study researcher Blake Cady, MD, professor emeritus of surgery at Harvard Medical School and Massachusetts General Hospital. The American Cancer Society recommends that women have an annual mammogram starting at age 40 and get an annual clinical breast exam. In between appointments, women should also conduct regular breast self-exams. The study also showed a dramatic shift in survival from breast cancer associated with the introduction of screening mammograms. In 1969, when modern mammography was introduced, half of women diagnosed with breast cancer had died by 12.5 years after diagnosis. By comparison,among women with invasive breast cancer in this study, only 9.3 percent had died within that time frame. Researchers said the change was due to improved screening as well as better treatments. 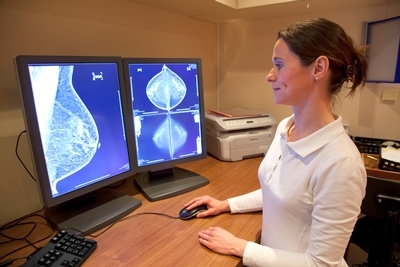 Mammograms have improved since the time frame of this study, first with the introduction of digital imaging and more recently with 3D imaging. With the 3D technology available at ella health, the machine swings around the breast taking multiple images in a short time. Doctors can then page through the images to better determine whether areas of concern are cancer or not. Other studies have shown that this system has increased breast cancer detection while decreasing the number of false alarms.